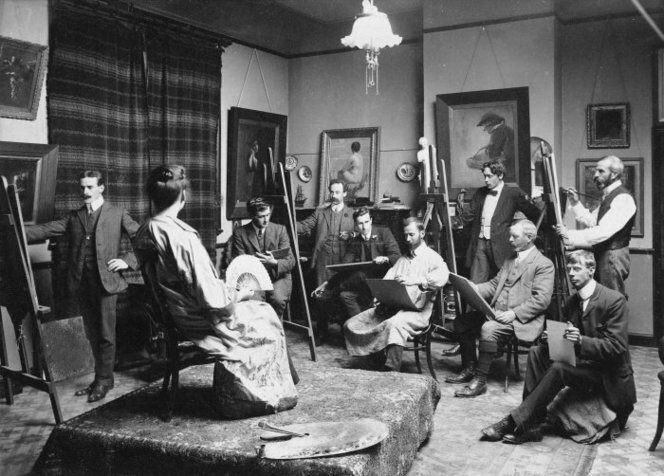 Kennaway Henderson is seen here in a Canterbury Society of Arts class ca. 1912. Standing: Cecil Kelly, Edwin Bartley, Raymond McIntyre, Alfred Wilson Walsh. Sitting: Leonard Hampden Booth, Andrew Kennaway Henderson, Sydney Lough Thompson, William Menzies Gibb, Charles E Bickerton. Charged with disobedience of a lawful command given by a superior officer, after he refused to submit to a medical examination, Kennaway Henderson, the 39 year old artist and cartoonist, became one of the older of the Canterbury conscientious objectors (COs) to be imprisoned at Paparua. He was also a married man, having married Pauline Gibson twelve years prior to his arrest. At his court martial in March 1918 Henderson asked that the statement he had sent to the Minister of Defence, Sir James Allen, be read to the court. ‘I am endeavouring to show’, the statement said, ‘that the Church has for the sake of power, supported militarism since Constantine, AND THAT MY RELIGIOUS CONVICTIONS ARE BASED UPON THE TEACHING OF CHRIST AND ALL OF OUR GREATEST THINKERS [sic]’. Henderson contrasted the way the British and New Zealand Governments had provided for objectors to military service, and went on to criticise the church which he accused of turning its back on the teachings of Christ regarding war. Names of churchmen who had shares in munition factories were stated and several firms that were said to help the Empire, Henderson claimed, were in reality making huge profits from the war. A number of spectators in the court applauded at the conclusion of the reading of the statement. Friends of Henderson’s, the writer Blanche Baughan and the artist Leonard Booth, then gave evidence as to Henderson’s character. Booth said ‘he had been intimately acquainted with the accused for some 14 years’ and that ‘Henderson’s anti-militarist views had, primarily, an ethical foundation’. Booth considered that Henderson ‘had held the ethical, moral, and, to some extent, the political views of Tolstoy all that time’. The sentence given was for nine months imprisonment with hard labour. On completion of his nine month sentence Henderson appeared before a further Court-Martial in November 1918, days before the armistice, on a second charge of failing to parade for medical examination on 25 October. Henderson declined to make a statement saying that he had nothing to add to what he had said last time and declined to call evidence as to character. The following day he was sentenced to two years’ imprisonment with hard labour even though fighting had already ceased and the war was about to end. According to his friend and biographer, Winston Rhodes, Henderson’s decision to become a conscientious objector was based on ‘his long-standing conviction of the insanity of war itself and from an unshakeable belief that all those who derived profits from militarism were enemies of mankind’. Two close friends, the artists Leonard Booth and Raymond McIntyre, were also objectors but both submitted to a medical examination and avoided prison: McIntyre was sent to a forestry camp while Booth’s appeal was allowed on the grounds that he was the only support for his widowed mother. Henderson took the more difficult path of refusing to co-operate with the military authorities. Before he was transferred to Paparua Prison he spent some time in Lyttelton gaol. A friend who visited him there found ‘drunken soldiers who were vomiting all over the place; no toilet facilities (only a bucket)’. At Paparua Prison, still in the process of construction, his artistic skills were put to use doing drawings to scale. Later he recalled the ‘hard labour’ of lying in the sun while doing this. He positively enjoyed the times when he was locked in his cell and could read and meditate in peace. We were not supposed to pass anything to the prisoners, but we all did. The prisoners came into the room and sat on one side of a long trestle table and when the warder turned his back as he stood in the doorway there was a rapid shuffling across under the table of apples, chocolate and tobacco. Henderson was also visited each Saturday by his wife Pauline who would walk from the terminus of the Riccarton tram. That looks as though he was considered less guilty; but the way it has worked out is, that the second man is now at large his sentence having expired fairly recently; while Mr Henderson’s nine months, unluckily for him, terminated just before the armistice, so that he got re-sentenced – that time, for two years. On his release from Paparua Prison in 1920 Henderson’s one desire was to move to a piece of land where he and Pauline could practise a self-sufficient way of life. This they did in the Henderson Valley, near Auckland, but the dream did not turn out as hoped. When Pauline became seriously ill and moved to Auckland, Kennaway went to Sydney where he found work as a caricaturist. Pauline later joined him there. In 1931 the Hendersons returned to Christchurch where they lived with Pauline’s mother and Kennaway pursued his dream of founding a radical independent journal. With great determination and hard work, and the support of two members of the academic staff of Canterbury College, Winston Rhodes and Frederick Sinclaire, he proceeded to produce the journal Tomorrow from July 1934 until April 1935 and again from July 1935 until 1940. Regular contributors included the writers Denis Glover, Allen Curnow, Frank Sargeson and Rex Fairburn while Henderson himself supplied a cartoon for each issue. The editorial policy of the paper was against war and fascism and in favour of socialism and co-operation. It was forced to cease publication in 1940 when its printers were told they would be prosecuted for sedition if they continued to publish it. Pauline Henderson died in April 1940 and Kennaway, along with his friend Leonard Booth, rather surprisingly were appointed censors of letters written to New Zealand soldiers during the Second World War. Kennaway Henderson died in January 1960 and was remembered for his life-long devotion to painting, his love of natural beauty and music, his integrity of character, his radicalism, his gentleness and his sense of humour. While he is best known for his cartoons, these were drawn from a sense of duty rather than because he enjoyed doing them: they were ‘his sole expression of his burning indignation at injustice and wrong’. ‘Court Martial: Charges of Desertion’, Lyttelton Times, 8 March 1918, p.8. Winston Rhodes, Kennaway Henderson: Artist, Editor and Radical, (Christchurch: Publications Committee of the University of Canterbury, 1988), pp.1, 16, 62. Andrew Kennaway Henderson to Sir James Allen, 22 January 1918, Material relating to Kennaway Henderson, Lincoln Efford Papers, MS-Papers-0445-49, Alexander Turnbull Library, Wellington. ‘Reservists’ Trial: Charges of Desertion’, Ashburton Guardian, 8 March 1918, p.8. ‘Court-Martialled: Reservist on Trial: Failing to Attend Medical Examination’, Sun, 8 March 1918, p.6. ‘Heavy Sentences: For Failure to Parade’, Evening Post, 9 March 1918, p.8. ‘A Court-Martial: Three Reservists Charged’, Sun, 5 November 1918, p.6. ‘Court-Martial Sentences’, Hawera & Normanby Star, 6 November 1918, p.5. Rhodes, Kennaway Henderson: Artist, Editor and Radical, p. 18. Rhodes, Kennaway Henderson: Artist, Editor and Radical, p.18. Rhodes, Kennaway Henderson: Artist, Editor and Radical, p. 21. Rhodes, Kennaway Henderson: Artist, Editor and Radical, p. 22. ‘General News’, Press, 15 May 1919, p.6. ‘The Genuine C.O.’, Press, 5 July 1919, p.10. Rhodes, Kennaway Henderson: Artist, Editor and Radical, pp. 32-36. Rhodes, Kennaway Henderson: Artist, Editor and Radical, p.67. Rhodes, Kennaway Henderson: Artist, Editor and Radical, p.72. Unsigned eulogy prepared for his funeral, Material relating to Kennaway Henderson, Lincoln Efford Papers, MS-Papers-0445-49, Alexander Turnbull Library, Wellington; Stephen Hamilton, ‘Henderson, Andrew Kennaway’, from the Dictionary of New Zealand Biography, Te Ara – the Encyclopedia of New Zealand, updated 9-Oct-2013.